Remember When Tim Duncan Almost Signed With The Magic? Among NBA players who spent their entire careers with one team, only Kobe Bryant had a longer tenure with his than Tim Duncan. 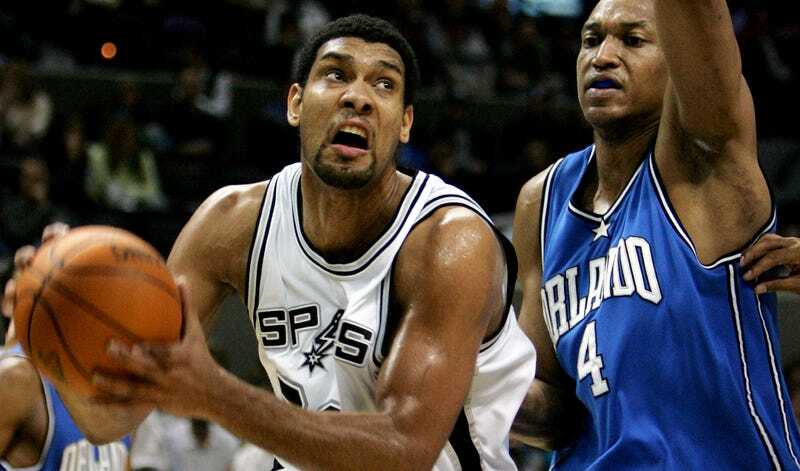 Duncan played 1,643 games for San Antonio, and no player and franchise are as synonymous as Duncan and the Spurs are. It’s easy to forget, then, just how close he came to leaving San Antonio in 2000, after only three seasons with the Spurs. A year after winning the 1999 NBA Finals, the Spurs whimpered out of their title defense in the first round to the Phoenix Suns. At that point, David Robinson and Avery Johnson were both 35, and Mario Elie was 37. Their core did not appear to be capable of running it back. Meanwhile, the Lakers and Blazers had started to turn into juggernauts. The Magic came hard. They flew Duncan in on a private jet. They super-imposed Hill and Duncan into Magic uniforms and slapped them on billboards around the city with the title “Imagine.” The Epcot ball at Disney World was scribbled with “Grant Us Tim” in lights. And this: Then-Orlando resident Tiger Woods helped with the house-hunting. Hill was sold and pledged on the spot. Duncan flew home and gave it some thought. “Once Grant and I get here, this will definitely be the city. The East is locked up. If Duncan comes here, it will be scary. Once David Robinson heard that Duncan was seriously considering leaving, he apparently flew back early from his vacation to Hawaii and helped convince him to stay. Duncan himself admitted later that he was “very close” to leaving, but that Robinson swooping in helped persuade him to stay. Ironically, the full-scale marketing blitz that Orlando used to attract Hill and McGrady overwhelmed Duncan and helped convince him to pick a situation where he felt more comfortable. Of all strategies to try with the cargo shorts thought leader, selling fame and glitz probably wasn’t the smartest play. Duncan stayed with the Spurs, of course, and the team managed to wait out the Lakers’ nascent dynasty and win four more titles over the next decade. Had Duncan left for Orlando, though? Maybe Grant Hill stays healthy, maybe Doc Rivers never leaves and assembles the super-Celtics, maybe Tracy McGrady wins multiple titles instead of retiring as a notable first-round loser, maybe San Antonio falls into basketball oblivion, maybe Kevin Garnett wins a title in Minnesota. The what-ifs are tantalizing and impossible to tease out, but Duncan departing for Orlando would almost certainly shake up the NBA as much as LeBron leaving for Miami a decade later did. “Well coach, you know, there’s no beach in San Antonio,” Duncan began, trying to break the news gently. You know when a woman gets a breakup call from George Clooney? This felt like one. Until Popovich realized he was being punked.